My daughter is old enough now to help with chores, and we're lucky that she's been excited to help (so far). Chores are tough on everyone involved, and different things work for each family. In the past, we would have her do chores as needed or when she was in the mood, but it's been a little crazy at our house lately since I broke my leg and haven't been able to get up and help much. So, to get a little more structure and an organized chore system in place, I designed a chore chart that I think will work great for her. She works hard when she has an organized list to work from, and really responds to incentives for getting a job done. Depending on the chores she was working on, the incentives ranged from money (usually a quarter), a trip to the museum, or just the promise of a surprise. Start by painting the frame with 2-3 coats of silver paint, letting dry between coats. Any color would work great, but I wanted a more neutral color for this project. 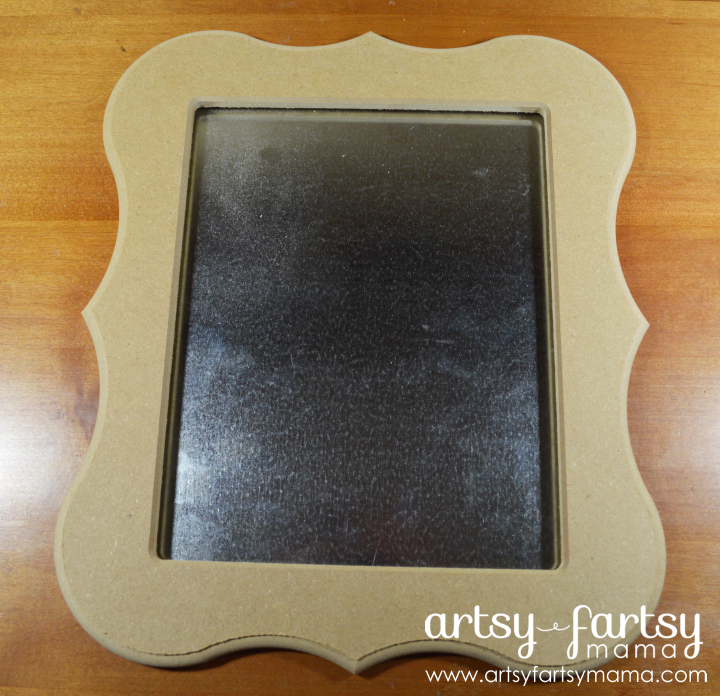 When the paint was dry, add a coat of silver glitter paint to the top layer of the frame. The more coats, the more glittery it ends up. Since I am a glitter enthusiast, I added 4-5 coats. Print the 8x10 chore chart. Laminate the print, and place in the frame. Add the metal sheet behind it to make the chore chart magnetic, then add the backing piece. You'll also need to add the 4 turn buttons to the back of the frame to keep the backing, metal sheet, and print in place. Also add the saw tooth hanger to be able to hang the frame on the wall. 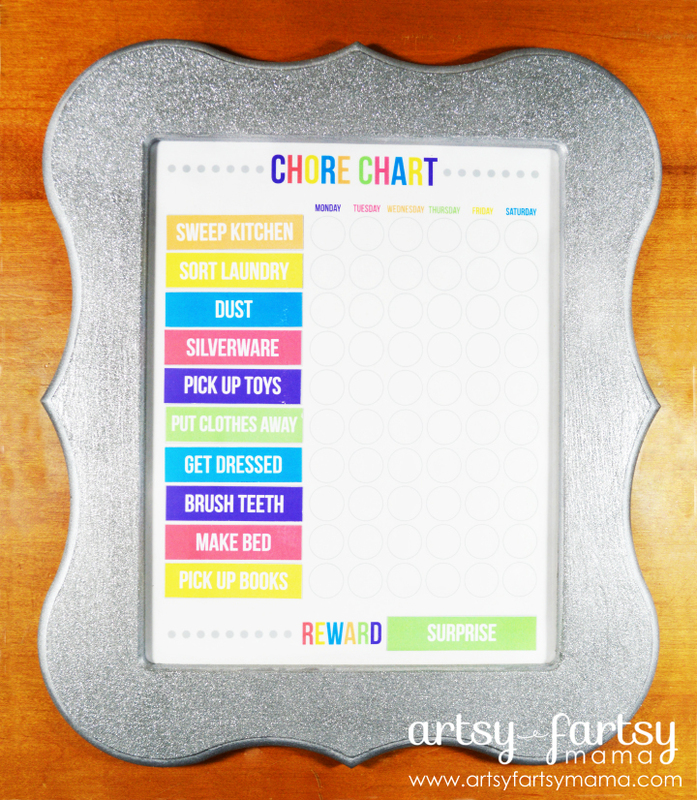 For this chore chart, I typed in the chores on different colored rectangles and printed them out on a printable magnetic sheet. If you've never used one before, one side is magnet, and the other is paper. Just run it through your printer, and cut with scissors for easy magnets! And because the print has been laminated, you can write in the chore options and/or mark when a chore has been done with a dry erase marker. Yes, the chore chart is both whiteboard AND magnetic! Now, for how the system works: I printed out 11 chores so we can switch out chores as we need to, or she doesn't need to do as many sometimes if it's a busy week. Plus, I've noticed a change of jobs makes it a little more doable and maybe a little more fun to have a change of pace. Before we decide on the chores for the week, I let her choose from 10 rewards. This could be money, a trip to the museum, or picking a movie (renting or watching one we already have) so she has a goal and incentive to get chores done. She marks the chores off each day, and if she's done all she needs to during the week, then she gets the reward! Pretty simple, but it has worked for us so far. For those with multiple children, I think it would be fun to make a separate chore chart for each child and add their name to the frame, and change the chores around for their age/skill level. Each child can choose their rewards, and hopefully this will make chore-time a little more bearable for everyone! *I realize every child and works differently, so this system may or may not work for your family. I just love how this system is easily customizable for every child, any age. Maybe it's just the organizer in me but I love chore charts. This is great! Pinning! Love Love Love this! Cute printable and love the glittery frame! I love this idea! My daughter just turned 3 and I want to start giving her chores this year. I love that you let her choose the reward for the week. Pinning! I love this! My kids really need chore charts as a visual reminder to get everything done. Dax is at the perfect age to start using this! Love the bright colors. I love chore charts. Just need to be consistent! Thanks for sharing. Yours turned out great! I love this! Cute and functional!